Social media firms are being threatened with new laws if they don’t do more to protect children online. 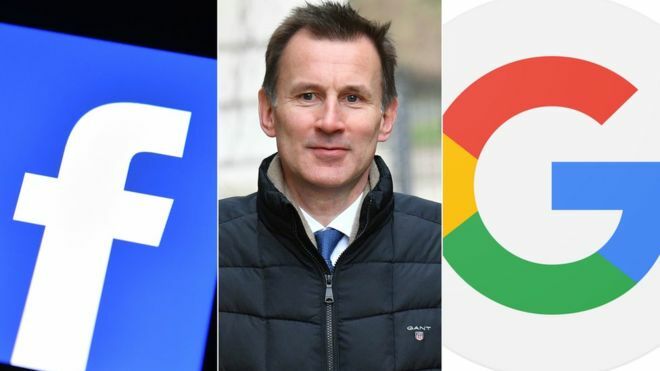 In a letter to companies including Facebook and Google, Health Secretary Jeremy Hunt accuses them of “turning a blind eye” to their impact on children. He gives them until the end of April to outline action on cutting underage use, preventing cyber bullying, and promoting healthy screen time. Google and Facebook say they share Mr Hunt’s commitment to safety. The age requirement to sign up to Facebook, Instagram, Twitter and Snapchat is 13. To use WhatsApp or to have a YouTube account, you must also be at least 13. Mr Hunt met social media companies six months ago to discuss how to improve the mental health of young people who use the technology. He told the Sunday Times, there had been “warm words” and “a few welcome moves” since then, but the overall response had been “extremely limited” – leading him to conclude that a voluntary, joint approach would not be good enough. “None are easy issues to solve I realise, but an industry that boasts some of the brightest minds and biggest budgets should have been able to rise to the challenge,” said Mr Hunt. The National Bullying Helpline, a charity which deals with online bullying, said the government needed to introduce legislation to govern the social media companies. “Asking Facebook and other social media giants to regulate themselves is like asking the press to regulate themselves. It won’t happen,” it added. Mr Hunt said the government would not rule out introducing new legislation to tackle the issue when it publishes its response to the Internet Safety Strategy consultation in May. He has also asked the chief medical officer to launch a review into the impact of technology on the mental health of children and young people. Katie O’Donovan, public policy manager at Google UK, said the company had shown its commitment to protecting children by developing its resources – such as an online safety course which has been taught to 40,000 schoolchildren. Facebook said it welcomed Mr Hunt’s “continued engagement on this important issue” and shared his ambition to create a safe and supportive environment for young people online. “We continue to invest heavily in developing tools for parents and age-appropriate products to meet this challenge and we look forward to continuing to work with our child safety partners and government to make progress in this area,” said Karim Palant from Facebook.